Today we have released a new version of Handsontable Pro (1.17.0) and Community Edition (0.37.0). 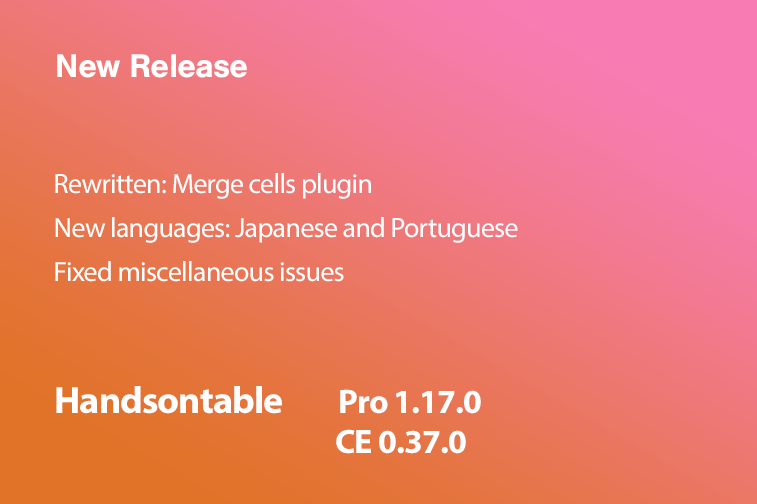 We have completely rewritten the merge cells plugin and fixed a lot of issues connected with it. This work will be continued in the next two releases as there are still some issues left. We also fixed the most severe issues connected with non-contiguous selection. That’s a relatively new feature in Handsontable so it is under heavy development. Last but not least, thanks to our awesome community on GitHub, we have been able to add two new language packs for Portuguese and Japanese. Bear in mind that this version contains some changes which are backward-incompatible.